Thank you for popping in to visit us this morning! I hope you’ve enjoyed your week and are having a relaxing Sunday! Despite the rain and mist, it’s a lovely cozy day here, and not at all cold which is great. I tried to photograph the misty hills for you, but the flash caught the rain drops! Don’t they look magical? I’ve been up since 6am as I had to drop KB off at work, then went to the vege market, as I do on a Sunday morning! I’m completely knackered after a busy week and a terrible night’s sleep which involved getting woken up by some drunk boys having a massive screaming match over some girl- lots of the F word and another neighbour intervening- phew! Then I had a totally crazy dream that I was trying to buy chocolate while walking on really tall stilts. So I’m having one of “those” mornings today… I was driving through the city and turned a corner and *CLONK* something hit the side of my car really loudly…like I had run over a big rock and it had smacked up into the bottom of my car… *boom boom boom* goes my heart, as it’s darkish and raining, but I managed to get to the market and home in one piece… then walked through the front door and *woosh* did one of those slips that nearly results in the splits and just about dropped my bags of veges everywhere! I decided I absoloutely needed to sit down in my rocker, stat, before I broke something, or myself, and have a rest and relax before I do anything like put the veges away! Luckily I managed not to drop and destroy these beautiful pieces of happy! Oh how I love pink, the whole spectrum of pinky goodness never fails to make me feel loving and happy. 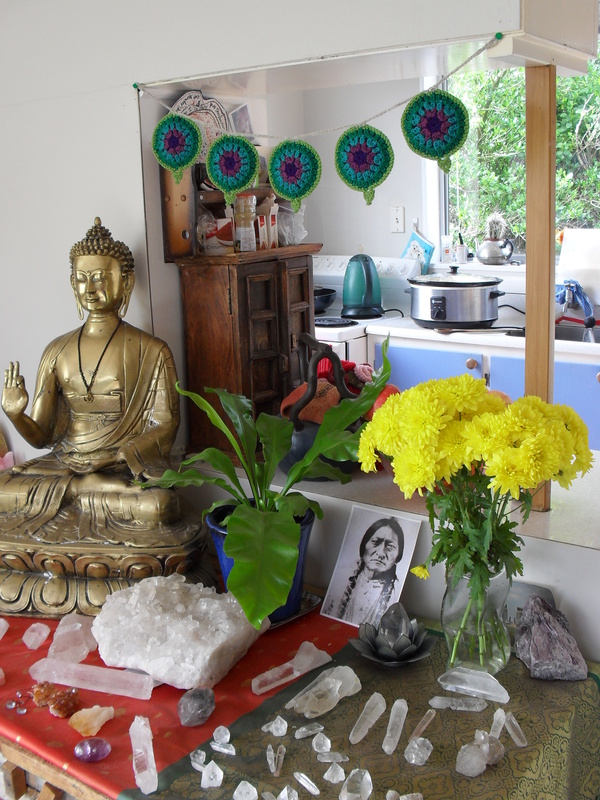 So yay, here I am, excited to be spending a little time in my happy place, sorting out the tutorial for my new favourite thing, the lotus mandala prayer flags! I’ve had a few people comment here and on Ravelry that they’re watching for the tutorial, and wow, thank you! That makes me feel really good, it was awesome to get such a positive response! I whipped up another set on Friday morning, they only took me a few hours, and I apologise for the terrible lighting in my photographs… my photos turn out best when the sun is shining, which it doesn’t always, so some of them get a bit dark. Yarn over hook, insert hook into stitch, pull through loop, yarn over, pull loop through 2 stitches on hook, yarn over, insert hook into same stitch, pull through loop, yarn over, pull loop through 2 stitches on hook (three left on hook) yarn over, pull loop through all three stitches on hook. To begin, we are going to make a magic ring, ch2, 1dc (counts as 1dc2tog), ch1, dc2tog, repeat 4 more times until you have 6 dc2tog, each separated by 1ch. Join with a slst to 2nd ch of original 2ch. Click here and a magical window will pop up with a photo tutorial for how to do this, it’s the same as the centre of the grandala square. My advice? Make all five at once and weave in the ends as you go!!! Change your colour, and bringing new colour through from the back, join with a slst, ch2, 1dc (counts as 1dc2tog), ch1, into same space, dc2tog. Ch1, into the next space, dc2tog, ch1, dc2tog… continue around the circle until each 1ch space from round 1 is filled with 2dc2tog each separated by 1ch. Join with a slst to 2nd ch of original 2ch. Weave in those ends now! Go on!!! Do it! It will make the whole process more fun if you don’t have that big job to do at the end!!!!! OK, so next round is pretty much the same as the last round, except in every second 1ch space, just do 1dc2tog. See the pic? And the next round is exactly the same as the last! For the outside, join the last colour with a slst and ch1. 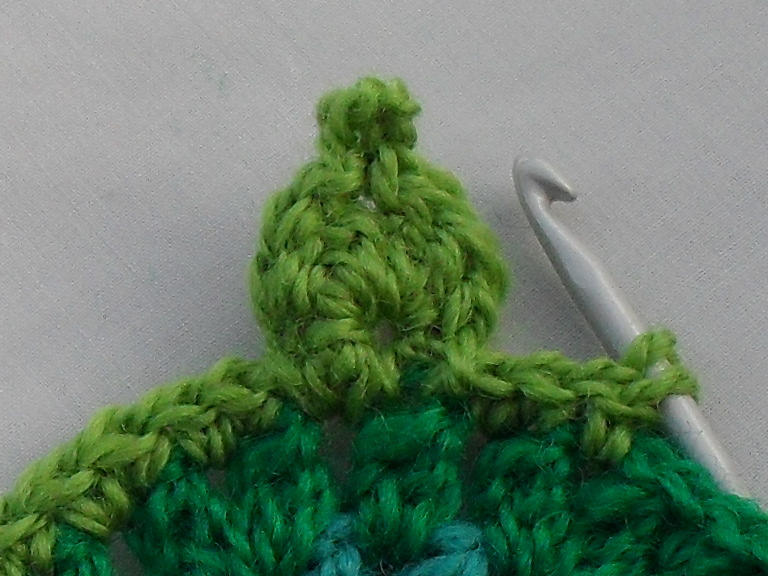 Now sc into each stitch around the edge until you get halfway around. ch3, and sc into the next space. Turn, and into the 3ch loop, sc, hdc, dc, ch1, dc, hdc, sc. Slst into closest sc, and turn again. Slst into the three stitches and slst into the 1ch space, then make a picot by chaining3, then slst into the first ch, slst into the smae space and slst into the three stitches back to the beginning. Slst into the next stitch and continue with sc around the edge. And viola! There you have it! I hope that made sense! Let me know if I talked you into a tangle! When you have made five, back them with felt by cutting circles to fit and loosely sewing onto the back. I tried to be lazy and not do it with this set, but they flopped in a terribly unattractive way, so back them I did! To join them, I ch10 then slst into a loop, ch15, join one mandala with 3sc along the top, ch20, join the next one…. 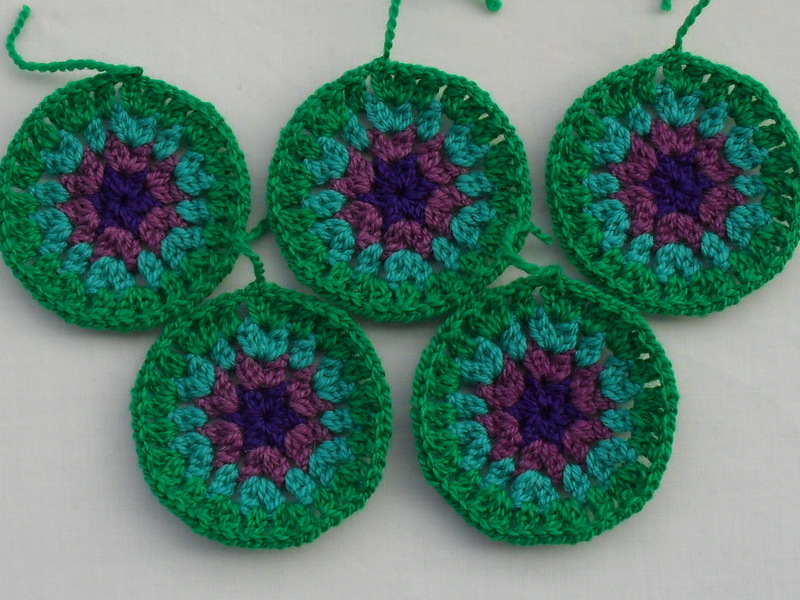 until I had a nice even row of beautiful hanging mandalas! Here’s where I hung them, here’s a picture of a spot in my house, which I’ll admit here, is comfortably, cozily cluttered with wonderful things! You can see through there into my kitchen, the slow cooker is cooking some delicious soup! 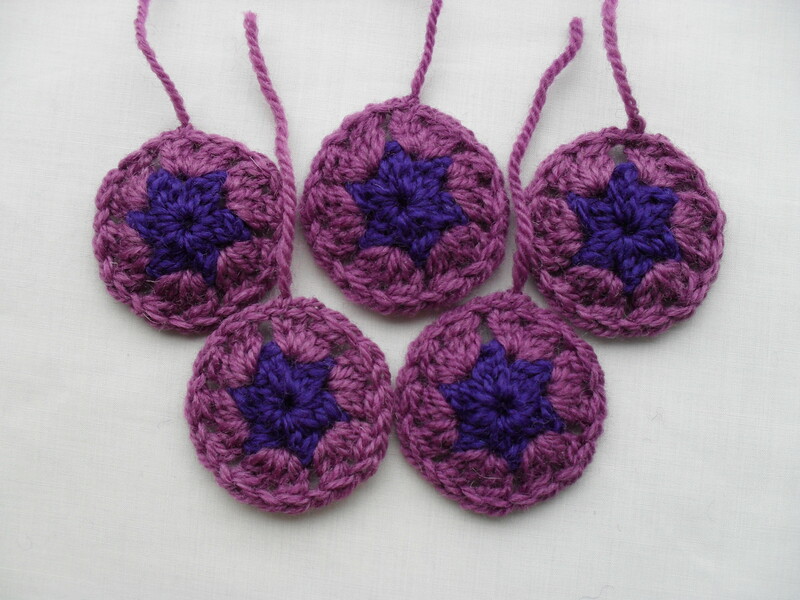 So I was reminded that it’s international crochet day today by a few blogs and how exciting is that!!! here’s what I’m going to get up to for the next little while! Continuing work on my latest grandala square cushion! 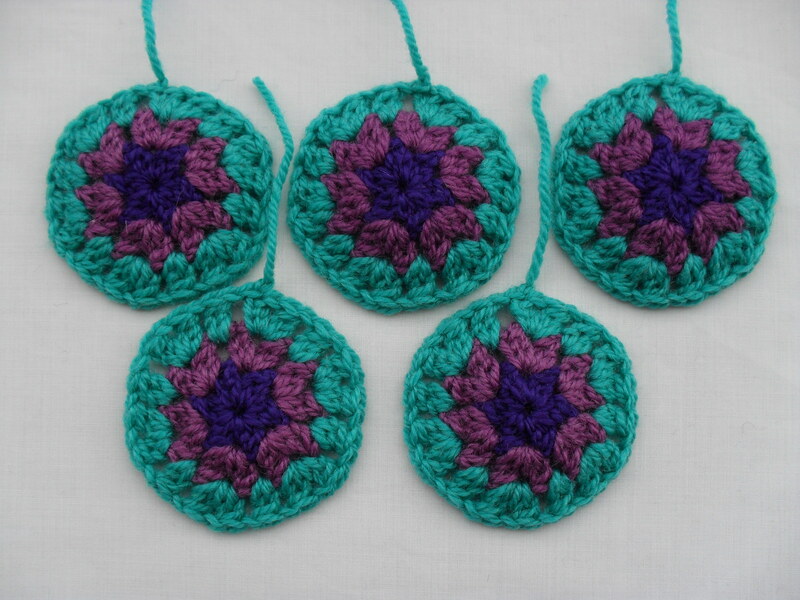 I’m loving looking around blogs and seeing grandalas popping up! I thought I’d try hooking one in a different colour scheme to my usual too-bright-to-look-at styles! KB loves it and I think I do too…. Later I’m off for a visit to my parents to get some wool sorted for Tuesday where I’m going to learn injection dying. I’ll be sure to take my camera and show you all the process too! 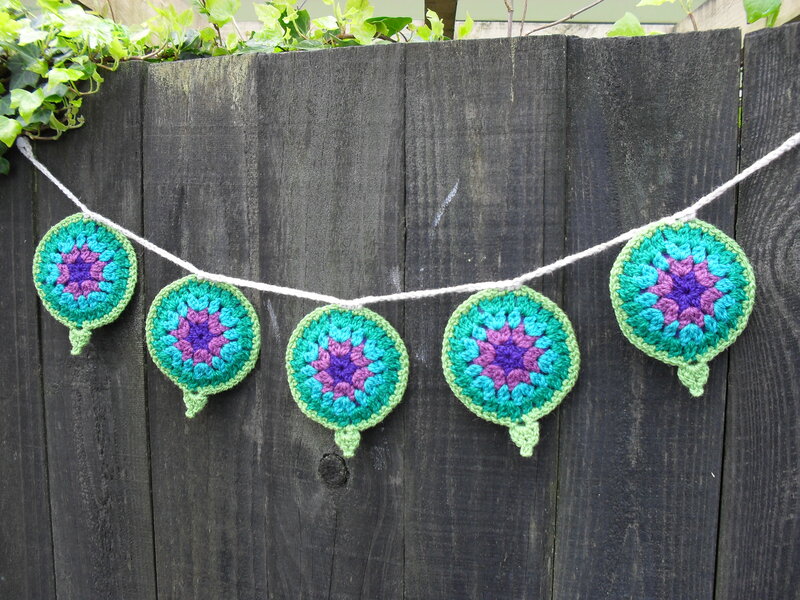 This entry was posted in Bunting, Crochet Goodness, Patterns, Prayer Flags. Bookmark the permalink. Crystal heaven there, I love where you have your mandala’s hanging, what a beautiful spot. When I finish the little jacket I am knitting I am going to sit and crochet from one of your tutorials and just keep going until I get it in my head how to read a pattern. Oh Alice be careful, did you find out what the big bang noise in the car was?? Hey I went for a skid once and landed under our dining table in a very inelegant way, funny now I look back on it. Can you email the link or give me the name of the site that you went on re the followers thingy, be interesting to read what he has to say. Thank you, and have a calm rest of the day, smooches to Raymond. Was there a bunny any where near you when you slipped? I am now blaming all my “graceful” moves on bunnies…just because it breaks my heart to think about all the money my parents wasted on dance lessons…. This is a most wonderful post ‘as usual’. of colours you use. Well done to you! I love your creative photography too!! Dear Alice, how nice to have my sunday morning coffee with you sunday morning post! Lovely post! I shall do defenetially L M Prayer Flag or many… they are wonderful! 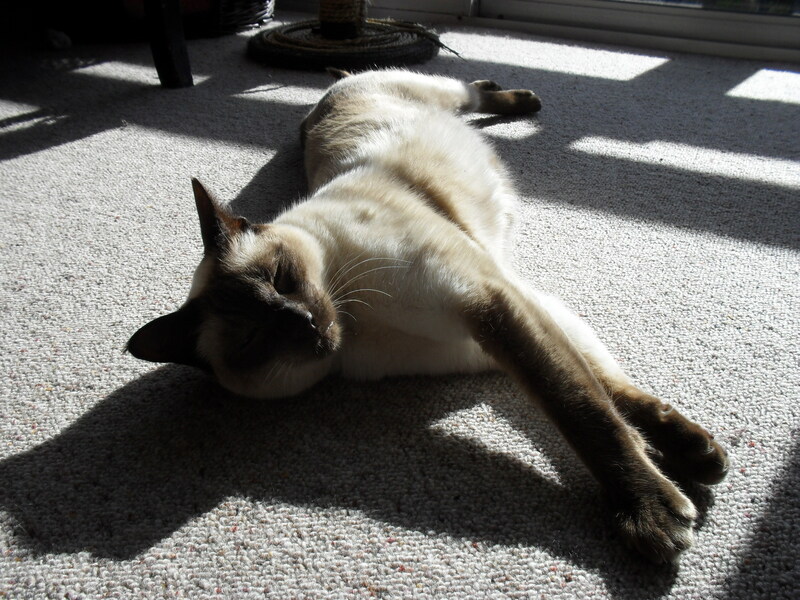 Raymond looks like he is about as active as Hamish on this Sunday! That first photo is great isn’t it! How lovely! 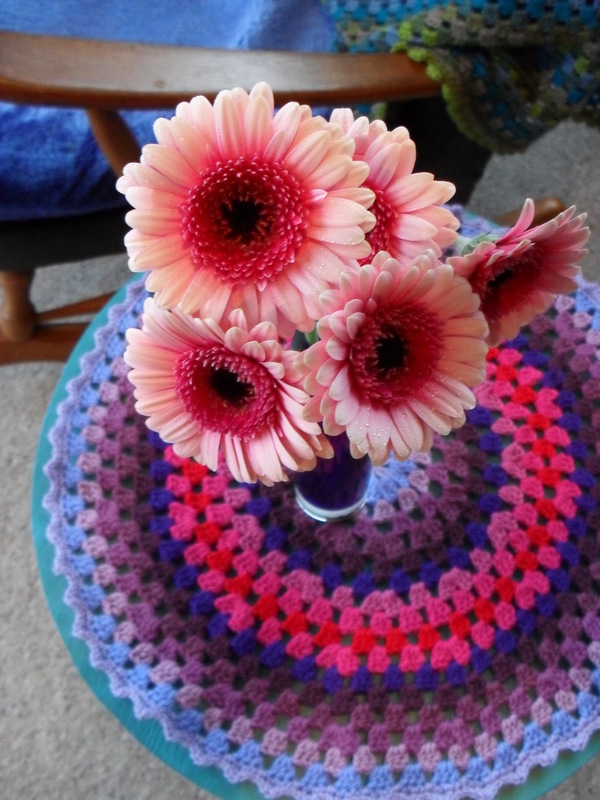 I always love to see what colors you’re using and you convinced me to buy that book Crochet Bouquet. Your blog has also taught me to look at colors in a different way too! Thanks for the tutorial and all of the lovely pictures! Hi Alice, I have finally stopped by your blog for the first time and I LOVE it! Like you, I only recently learned to crochet (11 months ago), and, like you, it has awoken this huge creative buzz in me! 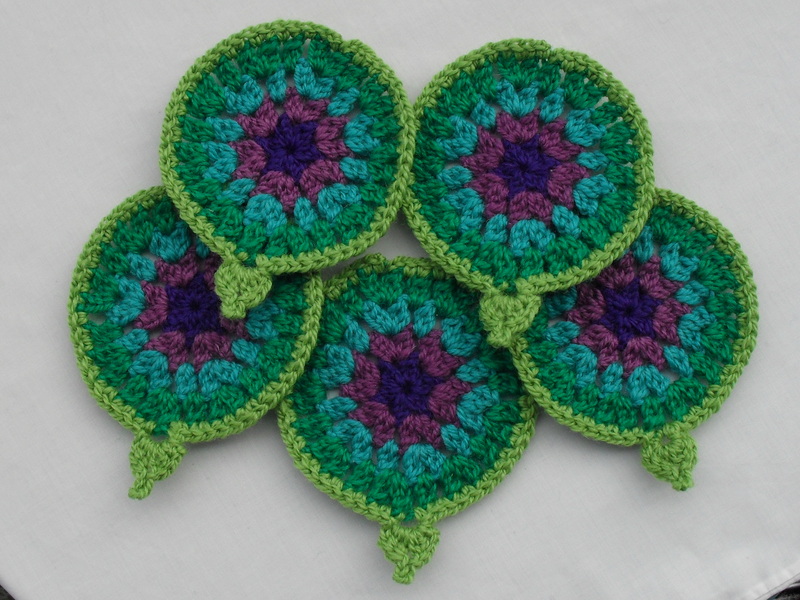 It’s so lovely to read about someone else who is also excited and inspired by crochet and who also enjoys doing it so much. I will be a regular reader of your blog from now on. Your mandalas are gorgeous 🙂 Thank you so much for all the nice comments you are leaving on my blog! Great tutorial – thanks for that! I found your blog via Debbi Y of Hooks and Yarns blog and I am so glad she referred you – it is great. I will be sure to pop back often. 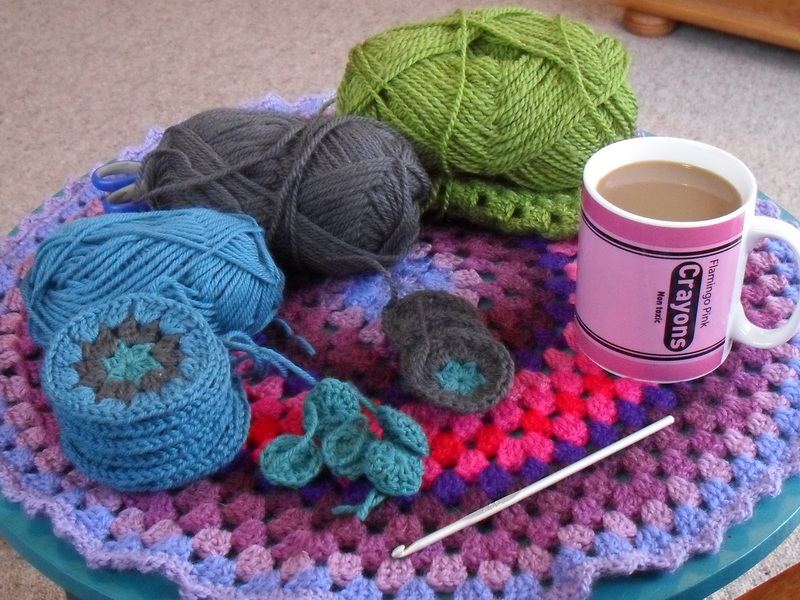 Happy International Crochet Day – and big hugs to Raymond! Hi! I just found your blog (thanks ravelry!) it’s lovely. 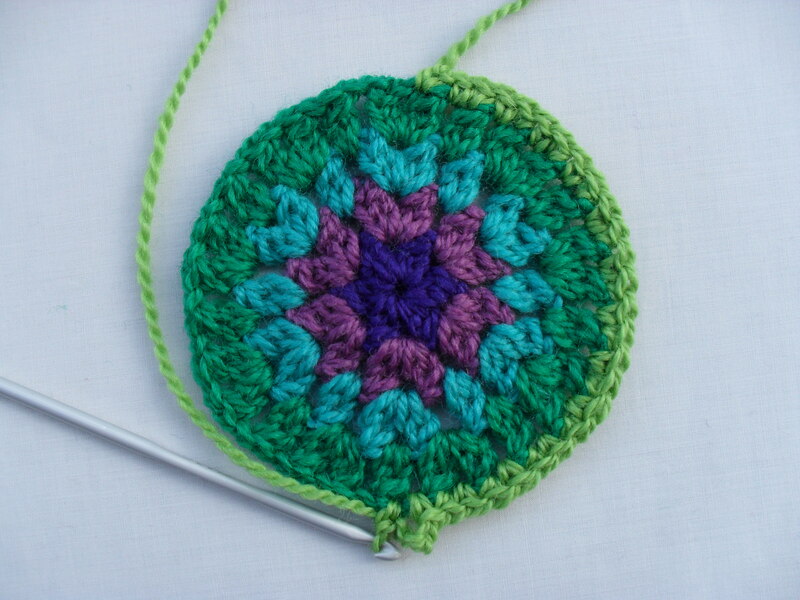 I’m going to have a go at the mandala pattern. Thank you for sharing. These are just beautiful. I love the saturated colors. Thank you very much for this lovely Tutorial. I hope you like it. Keep up your great work. I found you on Ravelry and can’t leave your site alone! The colors are entrancing and I think I’m hypnotized. 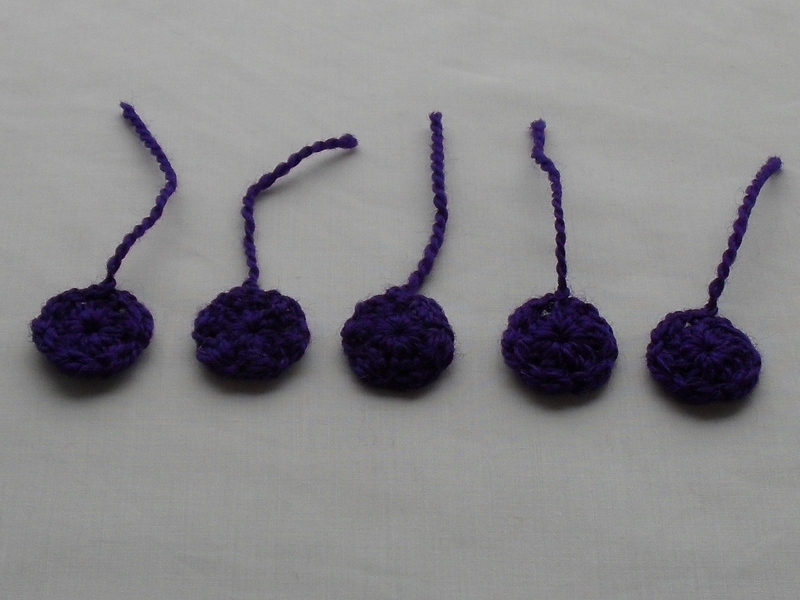 AND this is the first crochet pattern I’ve been able to and inspired to follow. Thank you for sharing your patterns! I wonder how you’d feel about me selling the finished item (in this case prayer flags). If that’s not okay than I’ll stick to holiday gifts and room decor. Love your site, very colorful and interesting. Could you tell me who the Indian in the picture is? I’m trying to figure out if it’s Chief Joseph or not. I just love this mandala flag and its colours. Each time I ‘m really overwhelmed by it so I come here often to take a glimpse at it. Some day I will maken one of my own! Alice, I just discovered your blog and your beautiful prayer flags. I will check back often. I loved your descriptions and pictures. I hope to try to follow your pattern for this. So far, I have crocheted scarves and many, many hats. thank you for the pattern! I just finished one. I will put it in my blog tomorrow! Lovely! Thanks for the tutorial. I will try to do it! I’ve just made some to hang up for my sons’s 21st Birthday on the 24th of June … they have turned out BEAUTIFUL… I even added some silver little beads on the ends of the picots… thank you so much my inspirational little flower you! Beautiful! ❤ your creations are amazing and I will be making the lotus mandalas for my baby girl and my altar. I can almost feel the crystal and reiki energy coming through the photos. I love your patterns they are so amazing. 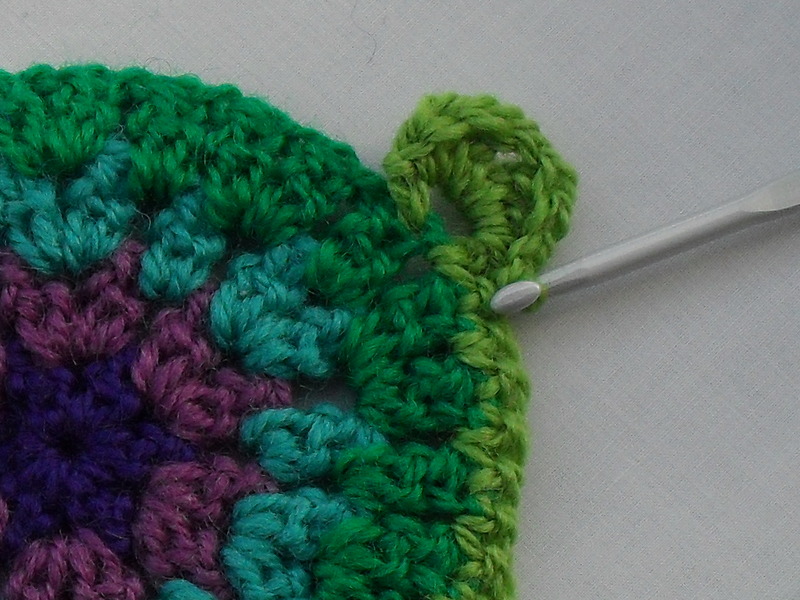 I’ve crocheted unsuccessfully in the past, but with your patterns it’s all clicking for me. Thank you so much! I’m going to hang my prayer flags at my husbands 41st birthday party. Light and love to you Alice! I love your Mandalas¡¡¡¡¡ I have done two. Thank you for all your patterns. I love the way you play with colours. You are a real inspiration. What a lovely, cozy home! No wonder you are so cheery… look at all those crystals and that gorgeous Buddha. That sure is to bring you wonderful energy! Your crafts are so lovely and inspiring! Thank you for sharing, these will be adorning multiple rooms in my home very soon! Blessings and Namaste. I just found this and I’m in love! Hi Alice, Your Lotus Mandala Prayer Flag is gorgeous. 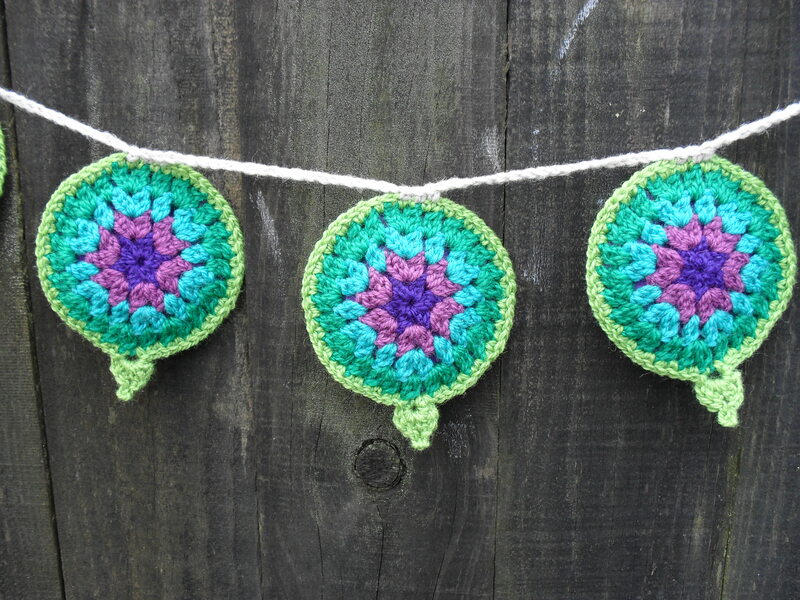 However I am looking for a pattern for a granny square style Tibetan Prayer Flag bunting. Could you whip up one for me and all your fans? Pleeeeeeeease!!! From a devoted fan. 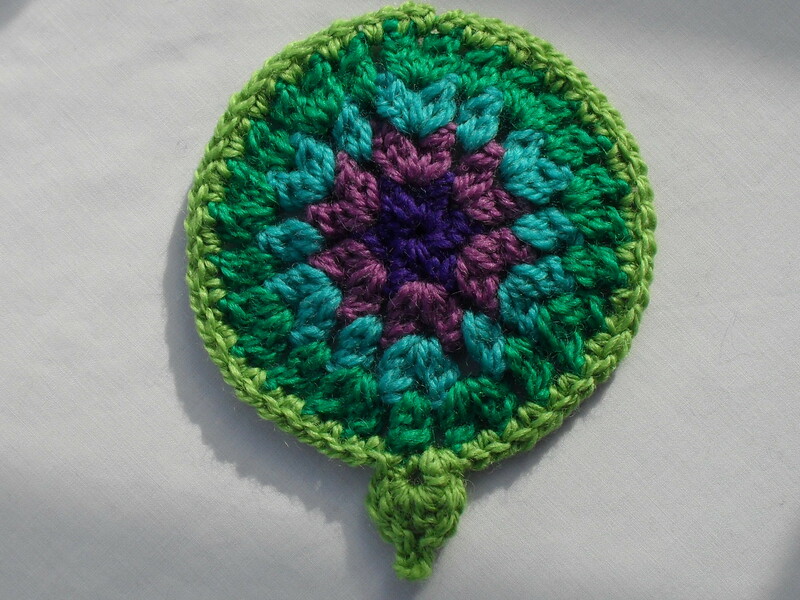 Pingback: Free Pattern Friday RoundUp!